They say that a good way to measure the quality of a production knife is to take it apart and then put it back together. A high quality knife will come back together just as easily as it comes apart. I recently took apart my Spyderco Sage 1. I have sung praises about the Sage 1 for years now, even going so far as to call it the “perfect EDC knife”. Whether the knife is “perfect” or not is debatable, but I have really enjoyed the Sage and it has remained in my collection for years now. But the action of my Sage had gotten pretty stiff. It was obvious to me that the pivot had become caked with dirt and the knife could use a good cleaning. I popped the Sage apart, and spent a good 15 minutes cleaning and oiling all the pieces. The knife came back together without a hitch, and the blade fell dead center as I gave the pivot a final twist. The action is smoother than it ever was. This, my friends, is still an excellent knife. Which leads me to today’s topic of conversation, the Spyderco Chaparral. It shares many similarities to my beloved Sage 1: The profile is near identical, both knives have faux carbon fiber scales and a wire pocket clip, and both made in Taichung Taiwan. The biggest difference is the size. The Chapparal is about an inch shorter in overall length, but the blade is less than a quarter of an inch shorter. Of course you also have different steel and different locking mechanisms, but in many ways the Chapparal can be seen as sort of a mini Sage 1. As I’ve matured I have grown to appreciate a smaller knife for my kind of EDC needs. Could the concept of the “perfect EDC” be a moving target? Could the Chaparral usurp my fabled Sage 1 as best and brightest? The Chaparral has an overall length of 6.375″, has a 2.812″ blade and weighs 2.5 ounces. Next to my Spyderco Sage 1, with its 3″ blade, the Chaparral is significantly smaller in every dimension. This knife is imminently pocketable and works just as well with jeans and a t-shirt or slacks and a tie. For those seeking a smaller pocket knife in the Spyderco lineup, but don’t want to go all the way down to a Dragonfly, the Chaparral fills the niche. Having owned both the Sage 1 and this Chaparral I personally prefer the size of Chaparral for office use. The blade is a classic Spyderco leaf shape, complete with full flat grind. This blade shape has proven itself to me many times over, but what I especially like about the Chaparral’s blade is the 2mm thick blade. This is a relatively thin piece of stock that has been ground even thinner. This is a very slicey knife, and I really like that. This wouldn’t be my first choice to pry open an ammo crate, but its a great choice for cutting stuff. Especially stuff that you come across in the general suburban EDC context. 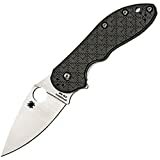 Spyderco selected Carpenter CTS-XHP stainless steel for the blade material. I have had some experience with CTS-XHP with my Spyderco Domino which oddly enough was the last Spyderco knife I have reviewed. This is a nice steel and I am glad Spyderco is rolling it out on more products. It has good edge retention, and decent corrosion resistance, but it’s surprisingly easy to sharpen and takes a very fine edge. Apparently these originally come in S30V, which is what my Sage 1 is equipped with. The S30V on my Sage 1 can be a little stubborn to get super sharp, so I think the upgrade to CTS-XHP was a smart one. The handle of the Chaparral is faux carbon fiber over full stainless steel liners. The carbon fiber has a quilted feel, providing just enough texture. The liners have been skelotonized to keep the weight down. Fit and finish of the handle is very tight, like all of the other Taichung Taiwan Spydercos that I have examined, with crisp lines, a flush backspacer, and polished steel. I like how Spyderco has only 2 exterior bolts showing; one at the pivot and the other securing the pocket clip (and rest of the handle) together. Underneath the scale there a couple hidden screws and even an internal stop pin – interesting construction for a lockback knife. Spyderco also offers the Chaparral in a couple titanium handled variants. These retail for $200 and $300. Personally I purchased the Chapparal as a user, and had no problem with faux carbon fiber, but I want to acknowledge the fact that other more expensive versions of the knife do exist. In hand the Chaparral feels like a Spyderco. The handle is unassuming yet receptive. The “50/50″ choil accepts the forefinger without issue and affords a very comfortable grip for an under 3” blade. The jimping on the spine grabs the skin of your thumb without irritating it. Spyderco has made a name for themselves designing “little big knives” so I am not surprised that the ergos are on point. Frankly, Spyderco probably considers the Chaparral a medium size knife in their lineup. There is plenty of room here to get work done and the ergonomics of the Chaparral are as thoughtful and refined as you would expect from any other knife designed by Sal Glesser. Spyderco went with their wire clip for the Chaparral – the same clip found on the good ole Sage 1. This is a proven clip design. I noticed the clip on my Sage 1 loosen over time. I thought that was the metal losing its spring tension for some reason, but it turns out that all I needed to do was tighten down the pocket clip screw. This clip is discrete and it buries the Chaparral deeply. I can get away with clipping this knife to a pair of dark slacks if I want to and most people wouldn’t give the clip a second thought. Spyderco set this knife up to accommodate ambidextrous tip up carry, and I think that is a nice compromise between form and function. It should come as no surprise that the Chaparral features a thumb hole. It is sharp and catches the thumb easily. The spring on the lockback is sturdy, and the action is smooth, although if I put any lateral pressure on the blade when opening I detect a faint grinding sound near the pivot. There are very thin phosphor bronze washers inside that can’t be seen unless you take the knife apart. Lockup on the Chaparral is very sturdy. As I mentioned before, there is an internal stop pin that prevents the up and down flex you often get with lockbacks. This is similar in concept to the tri-ad lock Cold Steel uses, and it makes for a very solid lockup. The lockbar is a little sharp and the spring is strong, so this is not a knife you will idly open and close for hours on end, but it works well and is satisfying to open and close. I think the Chaparral is a great little knife. I may be a bit biased because I enjoy my Sage 1 so much, but the Chaparral seems to tick a lot of boxes for me. Small, slim, well made and carefully designed, the Chaparral is a sleeper EDC knife that straddles the gap between Dragonfly and Spyderco’s 3″ bladed offerings (of which there are several). I can’t find much to fault with this one; certainly not the performance. It’s an excellent cutter and vanishes in the pocket. It’s nice that the knife is fully ambidextrous as well. Is it “better” than my Sage 1? Is it the “perfect EDC knife”? It could be, depending on who you are and what your preferences are. I will always have a soft spot for my Sage 1. Now that I cleaned it out the knife is just uber smooth, and the blade pretty much falls shut on its own after releasing the liner lock. For my needs the Chaparral is plenty of knife, but I love the smooth action of the Sage and the convenience of a liner lock. Both are worthy buys, and I don’t think the Sage 1 is ever leaving my collection. If you are interested in the Chaparral or are looking for a small “do it all” EDC knife that doesn’t sacrifice blade steel or ergonomics then I recommend it. I recommend buying the Chaparral at Amazon or BladeHQ. Please consider that purchasing anything through any of the links on this website helps support BladeReviews.com, and keeps the site going. As always, any and all support is greatly appreciated. Thank you very much. The Spyderco Domino is a knife that I almost wasn’t going to review. I’ve been following the Titanium Framelock Flipper Arms Race closely ever since the ZT 0560 took the production knife market by storm. Like pretty much everyone else, I’ve enjoyed these knives, but felt some initial hesitance to the Domino for some reason. I talk about this in my video, but I feel like the knife was almost too easy for Spyderco. After all, it parrots many of their already successful designs only this time we have a flipper, framelock, and bearings. Obviously I caved and bought the knife, and I am actually very happy I did. The Domino is a stellar performer and at a sub $200 price point I also think it’s a pretty decent value. Where else are you going to find the impressive feature set of the Domino, with a level of fit and finish that few companies can rival, with all the creature comforts of a Spyderco, for less than $200? The Domino comes in with an overall length of 7.68″, a 3.13″ blade, and weighs 4.1 ounces. The knife is a decent size for EDC. It’s a little larger and heavier than my Sage 1 (the quintessential EDC knife), but it still pockets well and makes for a reasonable daily carry. The blade is a classic Spyderco leaf shape, and includes a full flat grind, a very fine tip, and a slight curving belly. It’s everything you need for an EDC blade. The 3mm thick stock is ground thin and the knife slices well. Although I must say that I find the wide blade is a little precarious tasks like carving apples, a task I often relegate to my trusty Victorinox Alox Cadet. Still, it will slice and dice with the best of them and I find it a good match to common tasks like opening letters and breaking down boxes. Spyderco selected CTS-XHP steel for the Domino. CTS-XHP is made in America by Carpenter, and is supposed to be formulated with cutlery in mind. In practice I think it’s a good steel. It combines moderate edge retention with an ease of sharpening that I find lacking in steels like S30V. I had no issues with chipping or corrosion, and the steel took very well to both my strop and Spyderco stones. For those interested in extreme edge retention, I must confess that I found the steel a little lacking, but I am one of those people who prefers easy sharpening to ultimate edge retention so I wasn’t disappointed. I discuss this in greater detail in my video review. The handle of the Domino sports a faux carbon fiber scale over a titanium liner with a titanium frame lock. You also get flow-through construction, a sleeved lanyard hole, and a steel lockbar insert that doubles as a lockbar stabilizer. My biggest beef with the knife has to be the ridiculous handle scale. I suppose Spyderco wanted to step it up a bit with an unusual handle appearance, but I could have done without the Domino patterned carbon fiber. Ruminating on this further, I think the knife would have been even nicer if they went for a full titanium handle rather than the carbon fiber (which is really just a thin veneer of carbon fiber over black G10 anyway). Some may appreciate this “unique” handle material, but I think the after-market knife modifier crowd will be in business for a very long time if companies continue to release knives with such blatantly distasteful handle materials. The ergonomics of the Domino are good. This is what you would expect from a mid-size Spyderco. The bulbous handle fills the palm, while the double choils give you plenty of options for finger placement. There is a mild run of jimping on the spine of the blade that provides a little feedback without being overly aggressive, making the knife acceptable for extending cutting while still appealing to the TNP and mall ninja crowds. Although every folding knife handle is a study in compromise, I still found the knife reasonable to use in hard cutting situations like 1/2″ rope cuts and carving into bamboo. The pocket clip of the Domino is sturdy and functional, although it won’t win any beauty contests. Spyderco selected a standard hour-glass clip and gave it a lustrous black chrome finish. It definitely beats a satin finished clip, while the chromed finish gives it a little depth and character. The handle is drilled and tapped for 4 corner carry, and the knife doesn’t ride too deep in any of the positions. On these more expensive knives I tend to like a knife with a one or two position clip over a knife with tons of holes in it, but functionally speaking there is no reason to complain. This knife itself is relatively thin and light and isn’t too obtrusive in the pocket. While the pocket clip and carry isn’t anything outstanding, the knife will certainly be able to get from A to B without issue. Of course the Domino features a flipper, after all, that’s probably why you are interested in the knife. I am very pleased to report that the knife flips phenomenally. The detent is so well tuned that the blade practically explodes out of the handle when you press down on the flipper tab. I am very happy Spyderco took the time to ensure this aspect of the knife was squared away, as the action alone makes the knife worth the price. The over-sized pivot and caged bearing system certainly doesn’t hurt the performance either, and the knife is very fluid even when using the thumb hole. For lockup you have a very nice stonewashed titanium framelock that includes a steel lockbar insert. In theory this steel insert should prolong the lifespan of the lock, and if things ever wore out you could (again, theoretically) replace the insert. In practice the knife is rock solid, without even a suggestion of blade play in any direction. Much like the other titanium framelocks I have seen come out of Spyderco’s Taichung factory, they got the geometry right and the lockup is worry free. The steel insert also performs double duty as an overtravel-stop mechanism (sometimes called a “lockbar stabilizer”). This prevents you from hyper-extending the titanium when disengaging the lock. I’ve never had this problem, it’s a nice touch and aesthetically it doesn’t detract from the knife. In conclusion, the Domino is one hell of a knife. Here we have classic Spyderco fare like a thumb hole, 4-corner pocket clip, and good ergonomics coupled with the latest crazes in modern knifemaking. That alone should be reason enough to give this one a try, but I am very happy to report that they really executed this right. As I mentioned alone, for a flipper aficionado the action alone will be worth the price of admission, and Spyderco has once again turned out a very high quality product from Taichung Taiwan. Of course an obvious comparison would be with their previous flipper, the Southard, and it’s worth taking a second to differentiate the knives. First of all, the action on the Domino is vastly superior to the Southard. The detent on the Southard is acceptable, but it is weak in comparison to the crisp action in the Domino. Also, the design of Southard may be a little “out there” for classic Spyderco fans. Personally, I find the Southard to be a far more interesting knife, but to each their own. I am sure the Domino will appeal to traditional Spyderco fans. Of course I do have a few issues with the knife, and I might as well re-cap them now. Mainly I wish they went a different route with their handle scale, but I could also do without 4-corner carry on a $200 knife, and same with a sleeved lanyard hole. I think both the lanyard sleeve and funky carbon fiber detract from the appearance of the knife. The pocket clip could use a little work too. But by and large this is a solid effort for Spyderco, and I think it will be an excellent addition to anyone’s collection of high end production knives. I recommend purchasing the Spyderco Domino at BladeHQ or Amazon. Purchasing anything through any of the links on this website helps support BladeReviews, and keeps the site going. As always, any and all support is greatly appreciated – thank you very much. The Spyderco Techno is a small titanium framelock folder with all the fixings. It is designed by Polish maker Marcin Slysz, who doesn’t seem to have much in the way of background information on the internet. According to Spyderco, Marcin is an extremely talented knifemaker of international repute. I must admit, the knife designer’s pedigree isn’t what drew me to this one. Rather, I was taken in by the Techno’s charming design. Featuring bold lines and plenty of personality, this one really struck a chord with me. The fact that this knife also includes CTS-XHP supersteel and 6AL-4V titanium handles further piqued my interest. And when I learned it would be produced at Spyderco’s now legendary Taichung Taiwan facility, well, that sealed the deal. With an overall length of 6″, a 2.55″ blade, and a weight of 3.6 ounces the Techno falls firmly into what Spyderco likes to call “little big knife” territory. This a nice little nugget of a knife. It’s a great size for EDC and would also do well in anyone’s collection of titanium framelock folders. The drop point blade has been fully flat ground from a very thick (4.5mm) piece of steel. Out of the box I wasn’t super impressed with how this knife cut paper, but I quickly gained respect for the Techno after attacking some super tough 5/8″ manilla rope, and carving up a pressure treated piece of pine. While the thick blade is not the most amazing slicer, the knife is ground relatively thin so you still have a capable cutter on your hands. The thick stock carries out all the way to the tip, leaving you with a stout blade able to handle a large variety of tasks. 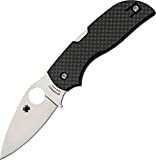 Spyderco selected CTS-XHP steel, which has previously never been used on a production level Spyderco knife. This is also my first experience with CTS-XHP, and I was eager to try it out. So far my experience with CTS-XHP has been extremely favorable. It’s a powdered stainless steel with an ultra fine grain structure. When I sharpened the knife I didn’t have any issues and it has held a hair shaving edge through a number of nasty cutting chores including the aforementioned rope and wood tests, a good deal of cardboard, and a number of little EDC tasks that I encountered in my several weeks of carry time. The edge holding was extremely impressive, I had no issues with chips or rolling, and saw no signs of rust or staining either. I would definitely place CTS-XHP above something like S30V, and I look forward to spending more time familiarizing myself with this steel. The handle slabs are full titanium, and they have been given a tumbled finished for an attractive and easy wearing look. The handles have a smooth feeling to them (contrast it with a blasted finish on something like the small Sebenza), but it feels really high quality, and there actually is a decent amount of grip. There is a partial backspacer made of blue G10. I know some guys will really like the blue G10. Personally, I would have preferred to see titanium or carbon fiber instead. This is one of those “your mileage may vary” situations, so feel free to disagree. Overall, handle construction is rock solid. Everything screws together and all the edges have been nicely chamfered and meticulously finished. It’s really very impressive, and difficult to describe in a single paragraph. The ergonomics on this knife are surprisingly good. It’s a small blade so naturally I wasn’t sure how it would fit my larger hand, but I can get a comfortable 4 finger grip here without issue. There is a run of coarse jimping on the spine that looks good and provides a little traction for your thumb. The back of the blade is also wide enough to accommodate your thumb, giving you plenty of room if you desire it. There is more jimping on the backspacer. Again, it is more for decoration than anything, but it does offer some traction. There are definitely more comfortable knives on the market (consider the Sage 2 if you want to keep it reasonably small and also in the Spyderco titanium framelock family), but all in all I am very pleased with how this knife feels in hand. The pocket clip is the excellent Spyderco wire clip. This is a proven clip design that I personally have had a lot of experience with. This one has been sandblasted for a unique finish that will wear well, and it is positioned for ambidextrous tip up carry. I happen to be a big fan of the wire clip, and think Spyderco did an excellent job integrating it with the Techno. The knife rides very deep, and makes for an extremely discrete carry. At 3.6 ounces I did tend to notice this one in my pocket but, it’s not going to weigh you down. Since this is a Spyderco, deployment is made possible by a thumb hole – this time of the 13mm variety. It is well placed for right hand access, and is easy enough to get at with your thumb. Unfortunately, lefties will have a slightly different story. The thumb hole is partially blocked by the titanium lock bar, and it is difficult to access with the left thumb. I can pinch out the blade with my thumb and middle finger, but don’t expect to open this like a normal Spyderco. I can also sort of flick the knife open with my index or middle finger, but really it is a design with right handed people in mind. I still like the knife despite these issues, but it’s definitely something to consider if you are a lefty eying this design. The detent is firm, but the blade gives way to very smooth action aided by the phosphor bronze washers. Initially the knife was a little stiff, but that is because the tolerances are so tight. Mine almost immediately started to break in, and within a week or so of use it is became very smooth. For lockup we have a titanium frame lock. Spyderco pays homage to the lock’s designer Chris Reeve, and refers to it as a Reeve Integral Lock (RIL) in the Techno’s documentation. This is a nice touch in an era of intellectual property shenanigans. Practically speaking, I am extremely impressed with how this knife locks up. I hate to use hokey catch phrases like “this knife locks up like a bank vault,” but this knife locks up like a bank vault. It’s really impressive to slowly move the blade and hear the chunky framelock fall into place. My lock engages early (around 25%), hasn’t budged a millimeter (even after hard use and repeated flicking of the blade open), and there is zero blade play to speak of. Much like the finish of the titanium handles, you just have to feel this one for yourself to truly appreciate how nice it really is. It blows the Sage 2 out of the water, and gives the Chris Reeve Knives I’ve owned a good run for their money. Spyderco has another winner on their hands here. From a fit and finish perspective this knife is immaculate. If you have owned any of Spyderco’s other Taiwanese knives you will begin to understand where I am coming from, but even for their Taiwanese factory this knife is impressive. No doubt fans of Spyderco and titanium framelocks will find a lot to like with this little knife. It’s just really well done. Now that I am done gushing over the knife I do have some caveats for you. First of all, it is expensive and small. I don’t necessarily have a problem with either of those things, but I’m not going to say this knife is for everyone either. From a cutting perspective the geometry is a little chunky. Spyderco did thin the blade out, but the relatively narrow profile and thick stock has its limitations. Also, the ergonomics are good, but not outstanding. So the Techno is far from a perfect knife – at least on paper. However, if you are willing to overlook that sort of thing, and approach the knife from a wider perspective, then I think you will be very pleased with the Techno. It’s one of the most solid folding knives I’ve had the pleasure of reviewing, and the feeling of quality I get from this knife is difficult to describe. I also have to “keep it real” for my fellow lefties. This really isn’t a knife designed for us. I’ve managed to overcome the opening adversity, but unless you really like the design I don’t think it is worth the struggle. All in all I’m really impressed with the Techno. If you like smaller knives and have the money, check it out. It’s a very cool little knife. I recommend purchasing the Techno at Amazon or BladeHQ. Please consider that purchasing anything through any of the links on this website helps support BladeReviews.com, and keeps the site going. As always, any and all support is greatly appreciated. Thank you very much. I love it when knife companies refine their existing designs. Don’t get me wrong, I’m all for new and exciting models, but I’m almost more excited when a “good” knife turns into a “great” one. Cold Steel did just that with their latest version of the Cold Steel Recon 1. The new version (released in 2010) of the Recon 1 is lighter, has a stronger lock and a smarter design. What that leaves us with is a refined hard-use folding knife at a price almost anyone can afford. The Recon 1 is a large folding tactical knife or utility knife. Many people will not want to EDC the Recon 1, but I’ll say for a larger knife it is an extremely strong and relatively light EDC option. This could also be a decent trail knife/backup knife – I’ve seen people actually baton wood with this thing. Obviously these weren’t huge logs, but it’s still pretty incredible for a folder. The Recon 1 has an overall length of 9.75″, a 4″ blade, weighs 5.3 ounces, and is made in Taiwan. 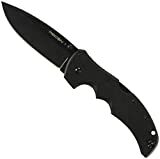 This is a large folding knife geared towards hard use and self defense applications. Certainly this could be used for every day carry (EDC) if you can swing carrying a knife of this size. As far as the blade is concerned you have the option of either a clip point (bowie) blade shape, American tanto, or spear point blade shape (not shown here). All blade configurations come hollow ground and have the option of plain or partially serrated edges. My personal preference is for the clip point or spear point blade shape, as I find the belly is useful for EDC. Regardless, the blades are all ground thin and cut nicely. If you need the additional tip strength of a tanto, or just like the look, then this is a great model to pick up with a tanto blade. Cold Steel originally chose Aus 8A for the blade steel here. The Aus 8 version of the knives are shown here, and these are what I used for my review. Cold Steel upgraded the blade steel to CTS-XHP around 2016. Although I haven’t reviewed the CTS-XHP version of the Recon 1, I have tested the Ultimate Hunter and Code 4 and the Broken Skull in CTS-XHP. It’s a great upgrade. CTS-XHP is still easy to sharpen like AUS-8, but the edge holding is much better. It’s a great stainless steel and an excellent upgrade for these knives. Also, the Recon 1 used to come with a teflon coated blade. These coatings chipped off easily and were long considered a downside to the Recon 1. When Cold Steel upgraded the blade steel to CTS-XHP they also started DLC coating their blades. This is a much tougher blade coating, and resists wear far better than teflon. This new coating holds up far better and I’ve had a chance to test it out on my Broken Skull. Cold Steel did an excellent job updating the Recon 1’s handle. They went with a linerless design and used two thick slabs of G10 for the handle. Some might find the lack of steel liners troubling on a hard use folding knife, but let me tell you – there is nothing to worry about. This is a very strong handle design (more on that below) and it has a 6061 aluminum backspacer. Everything is bolted together and there is a good size lanyard hole for added security. The Recon 1 has great ergonomics. A major feature is the deep double choil. This fits my hand like a glove. The handle is thick enough so that it fills the hand adequately and the edges have been rounded for comfort. The roughly textured handle helps to ensure a firm grip under a variety of conditions. Note that there is no jimping on the thumb ramp. In this case, I don’t think the Recon 1 needs jimping, your hand is not going anywhere with this handle design. That said, it certainly wouldn’t hurt. Due to the curvature of this handle design Cold Steel sells this knife with 2 pocket clips. This is so both left and right handed users can carry this knife comfortably. As a leftie, this sort of thing brings a tear to my eye (almost). I suspect some manufacturers don’t make clips reversible to keep costs down, but to see CS go so far as to make a second clip – well, that is really a statement and doesn’t go unnoticed here. Note that the clips allow for tip up carry only (fine by me) and that the clips has been given the same teflon coating as the blade so expect it to show wear. The Recon 1 is deployed with a single thumb stud. The thumb stud is easily reversed with a screw driver, but in a perfect world I’d rather see ambidextrous thumb studs right out of the box. The Recon 1 has a powerful backspring, so it isn’t the easiest knife to deploy, but with a little wrist action I have no problems at all snapping this blade out. And it does snap out, with a loud and authoritative crack. This is a knife that deploys with confidence thanks to a smart design and phosphor bronze washers. The Recon 1 has the Andrew Demko designed Tri-ad Lock. This lock is phenomenal and is the strongest lock currently on the market. It’s a beefed up backlock with the inclusion of a stop pin. The stop pin takes all the force of heavy duty tasks rather than the locking mechanism. What this means is that this lock will take more stress and punishment than anything else on the market. I’ve tested these locks extensively myself and my results match everyone else’s conclusions – that the Tri-ad lock is nearly bullet-proof. Recon1 vs. the AK-47 or the American Lawman? Chances are, if you are interested in the Recon 1, you may also be interested in the AK-47 or the American Lawman. If that is the case, I recorded a video where I do a detailed comparison of these 3 models that you may find useful. If you still have any questions or are interested in another comparison feel free to leave a comment or contact me. The Recon 1 is an absolute beast of a knife. If you are looking for an inexpensive hard use folder, you really can’t do better than this Recon 1 folder with the Triad lock. The Recon 1 is very similar to the Cold Steel Ak-47 and American Lawman, 2 knives I have previously reviewed. If you are having trouble deciding between the three it really comes down to which knife you like the look of the most. They have minor functional differences but they are all tough as nails and ready for any task. Also, well after the initial publication date of this review Cold Steel made major upgrades. They upgraded the blade to a DLC coated CTS-XHP blade from a teflon coated AUS-8 blde. The upgrades Cold Steel made to the blade steel and blade coating addressed the 2 biggest complaints I previously had with the knife: soft Aus-8 steel that was serviceable, but didn’t hold an amazing edge, and a teflon blade coating that quickly chipped and looked bad. Granted, these upgrades have raised the Recon 1 from a $50 knife, to more like a $75 knife, but I think you are getting more knife for your money. The Recon 1 has been elevated from a good bargain knife, to an impressive cutting tool. At the end of the day, if you can carry a larger knife like the Recon 1 you are going to have a hard time finding a tougher pound for pound folding knife. It remains an excellent choice to this day. Personally, I prefer the slightly smaller and more utilitarian looking American Lawman, but if you like the dimensions of the Recon 1 then you won’t be disappointed with this knife. 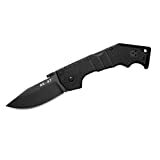 If you are interested in purchasing a Cold Steel Recon 1, then I recommend purchasing it at Amazon or BladeHQ. Purchasing things through any of the links on this website helps support BladeReviews.com and will help to keep the reviews coming. Any support is greatly appreciated. Thank you very much. The AK-47 rifle was designed by Russian Gunsmith Mikhail Kalashnikov in 1946. These guns were designed to be simple and rugged, and for these reasons the AK-47 design has enjoyed much popularity for over 60 years. The Cold Steel AK47 was designed with similar intentions. The original Cold Steel AKs were solid knives, but they received some severe criticism about their weight and durability. A second generation of the knife has appeared on the scene and both AKs has received a complete overhaul with a new beefier Triad lock, a slimmed down handle and a solid aluminum glass breaker / striker to replace the old pommel made of Grivory, a type of engineered plastic from Switzerland, that was the subject of many complaints. It seems that Cold Steel has given us an entirely new knife so I am interested to see how the second generation of CS AK-47s measure up. The full size Cold Steel AK-47 has an overall length of 9″, features a 3.5″ blade, and weighs 5.5 ounces. This is a large folder, suitable for work as a tough EDC knife and perhaps suitable in more tactical / self defense roles. The AK-47 has a large clip point blade. What I find especially attractive about this knife is that it is pretty much all belly. From the choil to the tip, the blade arcs out providing tons of practical space to get work done. Speaking of tips, the tip is reinforced with a swedge, and allows for excellent penetration while still being fairly durable. Furthermore, the inclusion of a high hollow grind makes for a great slicer. This is a well thought out and functional blade design, that works well in a wide variety of situations. Originally, this knife was offered in AUS-8 steel with a teflon blade coating. That’s the version shown in the pictures. In 2016 Cold Steel upgraded their entire line, and now their premium blades all come in CTS-XHP. The previously teflon coated blades now come with a black DLC coating. While this increased the price of the knives, the upgrades are well worth it. CTS-XHP is a superior steel, and DLC coatings are the best in the business. That, combined with this knife’s excellent deep hollow grind, make it a capable slicer. The handle on the AK-47 is completely linerless, and features thick slabs of G10 that bolt into an aluminum backspacer. Some people (myself included) would immediately question the strength and durability of a linerless folding knife handle. I can assure you that the handle design is extremely solid. These knives were made to take a ton of abuse, and I can’t make the G10 budge a millimeter, even when pushing on the handle with all my strength. Everything is very well finished, with all the corners rounded off and the parts lining up perfectly. The AK-47 feels great in hand. The knife was designed to provide an extremely secure grip, and to maximize reach. Unlike say, the American Lawman, you are not going to be able to easily choke up on this handle, but if you need to use the knife for a lot of slashing, it’s going to be almost impossible to take it out of your hand. The G10 is exceptionally grippy, but I will say that the thumb ramp is pretty smooth. The design couple probably benefit from some better jimping. However, because of the way the handle is shaped, I really don’t see the absence of jimping as a huge deal. It is going to be nearly impossible to slide forward on this knife. The it is also worth mentioning that the AK-47 features an exaggerated pommel. This time the pommel is made of 6061 aluminum and is a big step up from the old plastic version. Not only is it light and strong, but it serves as a solid anchor point for the handle screws. This is what allows the knife to be linerless and so lightweight. Naturally, this pommel could be used as a glass breaker, a hammer, or some sort of non-lethal defensive option. Rounding out our handle is the pocket clip. Cold Steel actually gives you two pocket clips; one for either side. The position of clip doesn’t allow for deep carry, and is instead optimized for easy of deployment. Also, this knife only allows for tip up carry. I have found retention to be very good with these clips, with the only downside being that the strong clip and rough G10 can tear up your pockets a little. Despite these perceived negatives I have found this to be a very sturdy and reliable clip. The AK actually carries really well for its size and the strong clip keeps the knife in place. To open the knife, the AK-47 utilizes a thumb plate and phosphor bronze washers. The thumb plate allows for ambidextrous opening of the knife. It is possible to flick this knife open, but it takes some skill and wrist action, because the backspring for the lock requires a good amount of force to overcome. If you really want to open this knife fast your best bet is to use the thumb ramp as a wave feature. By far this is the easiest way to quickly and consistently open the knife. Now arguably the biggest change between this AK-47 and the old version is the brand new Triad lock. The Triad lock is a type of modified lock back designed by Andrew Demko. It includes beefier hardware and a stop pin, so force gets placed on the pin instead of the locking mechanism. In practice the lock on this knife is extremely strong and is capable of withstanding repeated spine whacks, batoning, and other common torture tests. The only issue with the Triad lock is that sometimes the spring can be too strong to use the knife comfortably. I will say that once you get the hang of it, disengaging the Triad lock isn’t bad (it also gets easier as the knife breaks in). AK-47 vs. the Recon1 or the American Lawman? Chances are, if you are interested in the AK-47, you may also be interested in the Cold Steel Recon 1 or the American Lawman. If that is the case, I recorded a video where I do a detailed comparison of these 3 models that you may find useful. I was very by these new versions of the Cold Steel AK-47. It’s great to see how CS listened to feedback and responded with a highly improved knife. In fact, since I originally published this review in 2011, Cold Steel continued the upgrade path and bumped up the blade steel from AUS-8 to CTS-XHP. A solid knife has kept getting better and better. The relatively lightweight design, the improved handle and lock, the better pomel and pocket clip – it’s all been fixed up, and still at a good price. In the past, people would gripe about the the cheap AUS-8 steel, but now that the steel has been upgraded there is little to complain about. Some wont care for the aggressive styling of the AK-47 design, and for those folks I might recommend the American Lawman or the Recon 1. I recommend purchasing the Cold Steel AK-47 at Amazon and BladeHQ. Please consider that buying anything through any of the links on this website helps support BladeReviews.com, and keeps the site going. As always, any and all support is greatly appreciated. Thank you very much.